Total Immersion Ultra Efficient Freestyle program will transform your swimming technique and develop an efficient sustainable freestyle. A freestyle program for swimmers who want to correct their stroke for better efficiency and performance. Learn how to balance, streamline and propel the smart way! TI programs will leave you with greater skills, a higher swimming IQ and, most important, a specific plan to make ongoing improvements. This is an awesome read for swimmers and coaches. Balance is a non negotiable foundation for any sporting movement. Have you ever seen a world class golfer, tennis player, cricketer, track and field athlete perform their sweet spot move in an unbalanced position??? Every move of precision is addressed from a stable balanced platform, only then can the movement pattern unfold to achieve optimum performance. Yet a stable balanced platform is the very thing we don’t have in water! To swim efficiently, you must master Balance first. I’d go so far as to call it “non-negotiable.” But the effect of learning Balance can be much more far-reaching. It certainly was for me. In September 1988, I met Coach Bill Boomer at a coaching clinic and learned that “the shape of the vessel matters more than the size of the engine.” Boomer also said that Balance is the foundation of vessel-shaping– his term for streamlining your body. Though I’d been swimming for nearly 25 years, and coaching successfully for 16 years, prior to that day I’d never heard a single mention of Balance as a swimming skill—much less the most important one. Soon after, I visited Boomer in Rochester, NY to learn more about “vessel-shaping” and watch him coach his University of Rochester swimmers. While there, I asked Boomer to show me how to balance. He had me perform a drill, while kicking lightly in a prone position with my arms at my sides. When I aligned my head and hips, as instructed, and shifted weight forward to my chest, my hips instantly rose to the surface and my legs felt light. I was moving just as fast, but with a noticeably easier kick. I repeated the drill several times, memorizing these new sensations, then swam a length of whole-stroke. My stroke felt stunningly different. For 25 years, my legs had felt “heavy.” But after just a few minutes of practicing a simple drill, they felt light! 1.) I’d swum only sporadically, and without real enthusiasm, for nearly 20 years since college, with no purpose other than to get exercise. Since that day, I’ve become a passionate swimmer, and my passion for swimming has only grown. 2.) Prior to that day, the only changes I’d experienced in my swimming had been marginal and temporary. After months of hard training, I could swim longer and faster— but that effect disappeared as soon as I stopped training. The change I experienced through Balance was more dramatic than anything I’d ever known, and has become permanent. Not only do I now feel positively brilliant every time I swim but—even after missing practice for several weeks—I recapture that feeling upon my return. 3.) Experiencing such a fundamental and striking change made me realize that, though I’d swum for almost 25 years that day, I still had much to learn. And in fact, I’ve continued to learn new skills and discover new insights (kaizen-style!) for over 25 years since. 4.) At age 37 (when I was introduced to Balance), I thought my best swimming was 20 years behind me. In reality, the best was yet to come! As a result of learning Balance, and many other discoveries that followed, I’ve improved continuously through my 40s, 50s, and 60s. The most limiting aspect of swimming is the sinking sensation. When your hips and legs drag below the surface, it’s impossible to feel comfort or ease, your endurance and speed are sapped, and your arms and legs are so preoccupied with fighting the sinking sensation, they’re limited in their ability to aid in streamlining or propulsion. Poor balance is the reason only 30 percent of us can swim 25 meters. Besides the fact that “survival swimming” is exhausting, the sinking sensation makes it impossible to enjoy swimming—or to anticipate a brighter future in swimming. That constant sense of lacking control in the water also blocks the calm focus needed to learn new skills. However, if you can solve such profound problems, you should also gain a sense of confidence in dealing with future challenges that you may face. When you eliminate the sinking sensation—and feel a sense of control over your body—you immediately feel much more “at home” in the water. You also achieve the foundation for every skill that follows. As you’ll see, none of these “mini-skills” are instinctive. To learn them, patiently give your full attention to just one skill at a time. The first two of these steps apply to all strokes and are universal requirements to achieve efficiency as a swimmer. The third step is particular to freestyle. Releasing your head to a “weightless” position that aligns with your spine is the most immediately impactful and fundamental Focal Point among all the efficiency skills taught by Total Immersion. To allow your head to find its most natural position, just let it go! Relax your neck and upper back muscles until you feel your head’s weight resting fully upon the water. While this action seems fairly simple, our head-lifting instinct is so deep-rooted that it may take months to overcome. Having done this, check that the crown of your head and spine feel connected by a straight line. When head, spine, and hips are aligned, the head’s 10-lb weight helps counter the downward pull of gravity on your dense lower body. As you’ll learn in a later chapter, keeping your head aligned and weightless while breathing is even more challenging, because the “survival” instinct to lift the head to breathe is primal. Make these head-position skills your first “efficiency checkpoint” for the rest of your swimming life. Thirty years after I first focused on aligning my head and spine, I still re-check it regularly and often find room for improvement. Before extending your arm in freestyle, enter it cleanly (eliminate noise and splash) and earlier than you think you should. Then reach on a moderate (not steep) downward slope as you extend forward. Reach full extension with the hand below the body-line. Extending your arms at a slight downward angle helps lift your legs closer to the surface, reducing drag and freeing up leg muscles to help with propulsion (as opposed to kicking reflexively, to combat sinking). Recall that Tim Ferriss’s and Vik Malhotra’s [mentioned earlier in the book] instructors handed them kickboards to “strengthen their legs” in an utterly futile effort to improve their body position. The action of balancing the body does exactly the opposite: by making your legs lighter, being in balance allows you to significantly calm and relax your kick—as I discovered when doing Boomer’s balance drill. Complement this by relaxing your legs as much as possible. This will also help prepare you for the highly efficient 2-Beat Kick (2BK), which we explain in a later chapter. The effects of balance practice on your mind and psyche are as profound as those on your body. 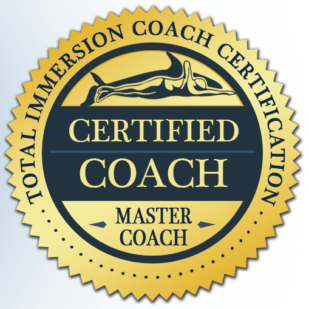 Total Immersion’s balance learning sequence—in combination with structured use of balance-oriented Focal Points—has been designed to prepare you cognitively, as well as physically, for a successful learning experience. Learning, practicing, and feeling Balance creates a “virtuous loop.” You feel good physically and mentally while Swimming in Balance. That motivates you to do it more–which results in improvement to those positive feelings. Thus, you spend even more time Swimming in Balance. 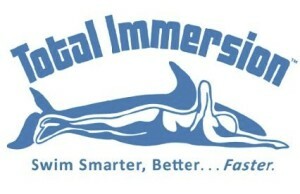 Improve your swimming technique and develop efficient sustainable freestyle with the Total Immersion™ Effortless Endurance Freestyle Program. This is a freestyle program for swimmers who want to correct their stroke for better efficiency and performance through balance, streamlining and propulsion. Effortless Endurance will leave you with greater skills, a higher swimming IQ and, most important, a specific plan to make ongoing improvements. Total Immersion™ Practice group is designed for swimmers who have completed a Total Immersion™ swimming program or one-to-one tailored program, and wish to continue their learning and progress. Total Immersion Practice group will keep your stroke mechanics well tuned, while we raise the bar! This weekly session will engage you in practice’s that continually improve your swimming stroke, with the addition of SMART sets that add challenge, and improve your problem solving capacity as a swimmer. Improve neuro-muscular and metabolic conditioning, learn to utilise and manipulate multiple variables of reps, distance, rest interval, tempo, stroke Length and RPE to improve your swimming performance.